Stop pulling out your ladder to pull muck from your gutters. Stay safely on the ground and enjoy your weekend. Gutter Guards installed by American Renovations LLC will keep leaves, pine needles, seeds, and other debris out of your gutters, allowing them to channel storm water off your roof to the ground as designed. With American Renovations LLC installed Gutter Guards, your gutters will never clog with leaves and twigs again. When gutters are free of debris, water flows quickly away from your roof and away from your foundation. Rain water drains away from your foundation. When its not raining, your debris-free gutters do not hold moisture that insects need to survive, so they are less likely to take up residence in your eaves, gutters, or attic. Save Time, Money & possibly your Life! With Gutter Guards, installed by American Renovations LLC, say goodbye to gutter muck. Stay off that shaky ladder with your feet firmly on the ground, where it's safe! Or if you normally hire a gutter cleaner, say goodbye to those routine payments. With American Renovations LLC Gutter Guards, you'll have one less problem to manage. Storms are coming ... ACT NOW! Gutter Guards by American Renovations LLC are the smart choice. Affordable and quick installation by American Renovations LLC makes adding Gutter Guards to your existing gutters simple. 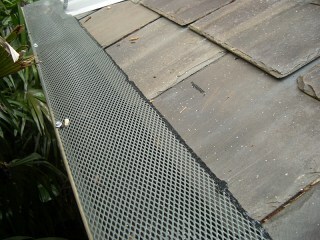 American Renovations LLC has been installing Gutter Guards since 1987. Don't get on the ladder again. Call American Renovations LLC today for a fast free quote!